Begins 17th June: Runs every Monday evening from 17th June – 22nd July (6 week course). (New For 2019) More info…………. How do I book one of your courses? When you have found a course you would like to attend (see above for dates and prices) please call or e-mail us to confirm that there is a place available. Once a provisional booking has been secured we will send you a booking form which should be completed and returned to us, by post, along with your payment, within 5 working days. The 2 day and 6 week evening courses need to be paid for, in full, at the time of booking. The 5 day courses require a deposit of £195.00, at the time of booking, with the remaining £300.00 becoming due six weeks before the start of the course. 2 Day Introductory and 5 Day Beginners Courses: These courses are suitable for beginners (aged 18 years and above) who have no previous experience of traditional upholstery and who are looking for a new and rewarding hobby. 5 Day Intermediate Courses: These courses are suitable for students who have already attended our Introductory or Beginners Course and wish to expand their knowledge of traditional upholstery techniques in order to have the confidence to tackle larger pieces of antique furniture. 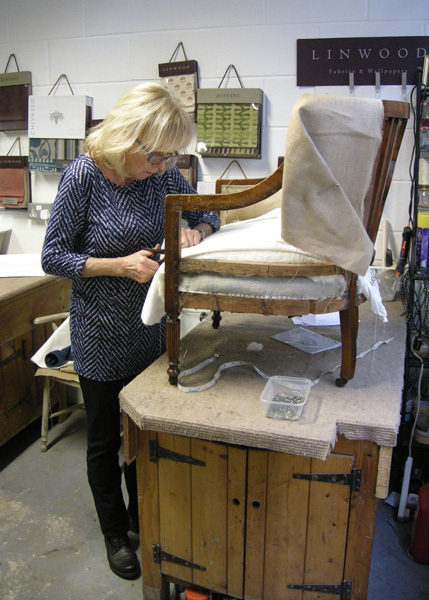 5 Day Advanced Courses: These courses are suitable for students who have already attended our Beginners & Intermediate Course and wish to expand their knowledge of traditional upholstery techniques in order to have the confidence to complete large and complex items of antique furniture. 6 Week Evening Courses: These courses are suitable for students of all abilities wishing to re-cover or re-upholster a piece of antique furniture. We highly recommend that you speak with us about the piece of furniture you would like to upholster during the course so we can advise you of its suitability in terms of size, complexity and timescales. 7 Week Traditional Upholstery Course – “Change Your Career”: These courses are suitable for students wishing to set up their own traditional upholstery business. More Info…………..
What do the different courses involve? 2 Day Introductory Course: During our two day introductory course you will learn how to professionally strip the existing upholstery from an antique chair (either a chair with a drop-in seat or a pin-stuffed chair), make any necessary adjustments, and then re-upholster using traditional methods and materials. 5 Day Beginners Course: On our five day beginners course you will begin by learning how to strip the wood on your antique chair and re-finish using either traditional French polishing techniques or a chalk paint and wax finish. You will also learn how to professionally strip the existing upholstery from an antique chair (either a chair with a drop-in seat or a pin-stuffed chair), make any necessary adjustments, and then re-upholster using traditional methods and materials. 5 Day Advanced Course: During our five day advanced course you will build on your existing skills by re-upholstering a more complex item of furniture. Suitable items would be a Parker Knoll or traditional wing armchair, a Victorian style ottoman box (supplied by The Unique Seat Company) where you will learn hand stitching and how to deal with curved shapes and forms, or an item of furniture with an element of deep buttoning. 6 Week Evening Course: Our six week evening course is suitable for students of all abilities. We recommend that you speak with us about the piece of furniture you would like to upholster during the course so we can advise you of its suitability in terms of size, complexity and timescales. NB: Furniture must be removed at the end of each evening course as, unfortunately, we do not have the room to store students furniture until the following weeks evening course. How many students do you have on a course? We teach a maximum of three students, at any one time. This ensures that students receive a very high level of personal tuition. All upholstery fillings and sundries are charged for by amount used and payment for these will be taken at the end of the course. As a rough guide, costs will be approx. £30.00 or less for a drop-in seat chair or a pin-stuffed chair. An ottoman box will cost approx. £45.00. or less whilst a sprung dining or bedroom chair will cost approx. £55.00 or less depending on the size and style. The approx. cost of a wing chair will be £95.00. Top fabrics & upholstery braids are also an additional cost, however, if you have your own you are more than welcome to use them. If not, we have an excellent selection of designer fabric off-cuts, in various sizes and prices, starting at £5.00 and a large selection of fabrics which can be purchased by the metre. These range in price from £10.00pm up to £95.00pm. Our beautiful upholstery braids are all priced at £4.95 per metre. 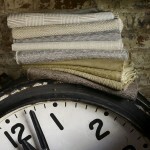 We are suppliers of, amongst others, Harris Tweed, Art of the Loom, Zoffany, Designers Guild, Osborne & Little and Linwood fabrics. If you would like to purchase fabrics from any of these companies, for your upholstery project then these can be ordered on a next day delivery basis. Our upholstery courses are held in Sheffield, South Yorkshire. Our workshop is located within minutes of Sheffield City Centre, on Mowbray Street, close to Kelham Island Museum. Please contact us for full details. 2 Day Introductory & 5 Day Beginners Course: You will need to bring a minimum of two chairs. You will need an antique chair with a drop-in seat and an antique pin-stuffed chair. On our two-day upholstery courses, it is expected that most students will only complete one chair, however, it is strongly recommended that you bring two chairs in case one chair proves to be problematic. 5 Day Intermediate Course: You will need to bring a small, sprung, antique, dining/bedroom chair. Please contact us for full details. 5 Day Advanced Course: You will need to bring a traditional wing armchair or Parker Knoll wing chair, a Victorian style ottoman box (supplied by The Unique Seat Company), or an item of furniture with an element of deep buttoning. Please contact us for full details. 6 Week Evening Course: We are more flexible with the type of antique furniture you can bring to the evening courses, however, we highly recommend that you speak with us about the piece of furniture you would like to upholster during the course so we can advise you of its suitability in terms of size, complexity and timescales. 7 Week Traditional Upholstery Course – “Change Your Career”: There is a set list of furniture which needs to be completed during the 7 week course. More Info…………..
NB: You can see examples of the types of chairs students have completed on our different courses by clicking here. If at all possible, please check that the chairs you intend to bring are structurally sound and in good condition so that time consuming repairs do not encroach on your tuition time. Stripping old furniture can be quite dusty/dirty work. We would advise that old clothes are worn for this purpose, on all our upholstery courses. As long periods of standing are also usually necessary we would also advise that comfortable, covered footwear is worn. We provide pens and paper for taking notes but it is advisable to bring a camera so that you can photograph each stage of the traditional upholstery process. What if I can’t find suitable chairs to bring? If you are unable to find suitable chairs for the course then you may be able to purchase them from us. We carry a small amount of stock for such eventualities. Prices range from £25.00 for a basic antique chair suitable for simply practising on, up to £150.00 for a more desirable antique chair. If required, please contact us, before commencing your course. Alternatively, if you wish to bring a piece of antique furniture to upholster, other than the types we recommend, then that is absolutely fine, although please let us know in advance so that we can give you an honest assessment of how long the piece may take to complete. We recommend certain types of chairs for our courses to enable students to gain the maximum amount of knowledge and to give the best possible chance of the project being completed within the individual course timeframes. Can I buy tools and materials from you at the end of my course? Yes. We sell upholstery tools, fillings, materials, sundries, fabrics and braids at extremely competitive prices. 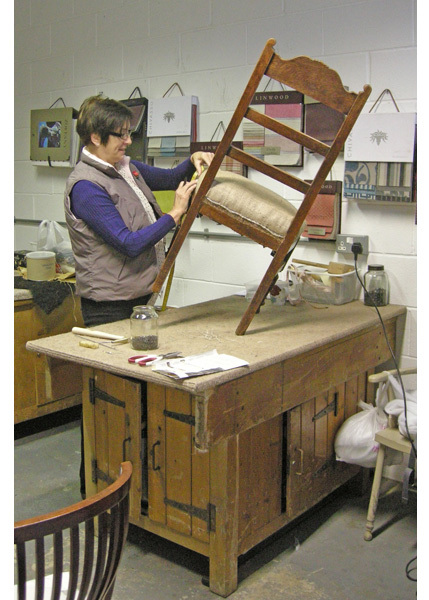 A price list is available exclusively to students who have attended our traditional upholstery courses. Do you have any testimonials from your students ? Please see below or, for more testimonials, see the Student’s Work area of the website. “I had previously done a beginner’s upholstery course with The Unique Seat Company and enjoyed it so much I decided to follow it up with the intermediate course. My decision was rewarded by the excellent teaching, attention to detail and friendly manner. I found both courses rewarding and look forward to the advanced one! I learnt a lot regarding traditional upholstery techniques that I can make use of in my own work. This is very much a result of the owner’s passion for the craft which shines though in her approach to her teaching.